The craftsmen at Vagabond Bowties make the Original 4-Way Reversible Bowtie from up-cycled fabrics. These are not factory made, mass-produced ties. Each one of our hand-made bowties is an original one-of-a-kind social and fashion statement, made right here in the U. S. of A. We search for remarkable fabrics refine and prepare them, and then hand cut and sew each one. Utilizing fabrics from select vintage clothing to sought-after contemporary remnants each Vagabond Bowtie offers unique appeal. 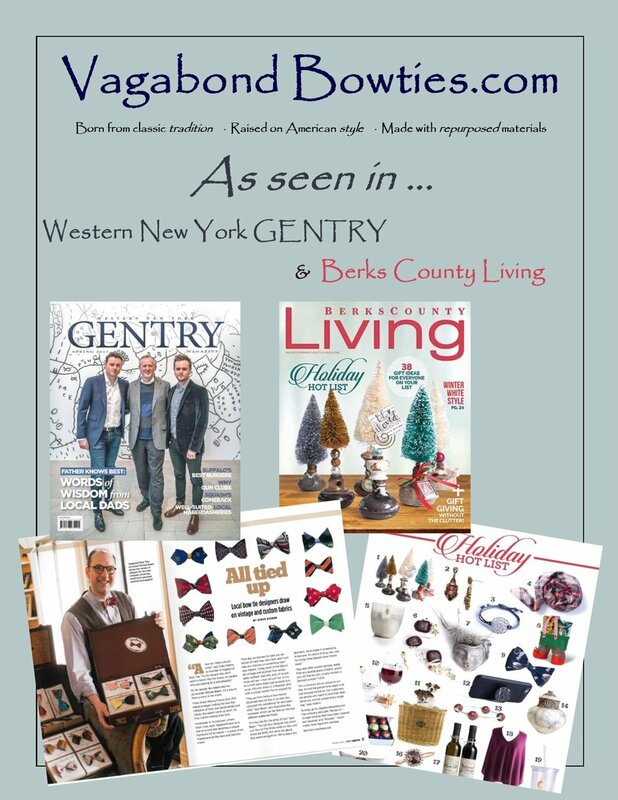 The Vagabond Bowtie brand has become well established in our home markets of Central Pennsylvania and Western New York. We want to share our passion for American-made Vagabond Bowties with a national audience. You and your clientele will appreciate the quality of the craftsmanship, the unique styling of our fabric selections, and our commitment to up-cycling and sustainability. Only Vagabond Bowties combines innovative design with traditional style to produce extraordinary hand-made bowties—each one as unique as the person wearing it. Contact us for wholesale pricing Volume discounts available, first qualifying order includes Point of Sale Display, contact us for details.